This Dhamala is the river mouth where there are different types of shells and fish, then the same area, maybe two creeks. Datam – waterlily roots; Rakay, circle (water chesnut); freshwater but in the saltwater on a mud flat. This is our traditional area and that is why we don’t want any mining or balanda fishing there. The river where we were walking is where our dreamings are. We have grown up with our culture and have kept it. Our sacred sites, our ceremonies, and secret dreamings. My people and ancestors have lived here for a long time. In other areas too people's ancestry goes back a long way – people still retain their laws and their culture and land. 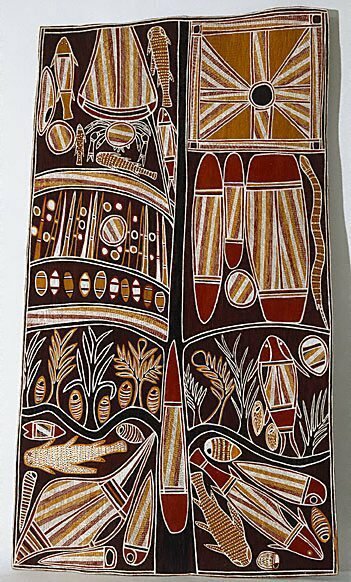 Description of painting from upper left corner, Left hand side referes to the Ngurrunyuwa (eastern bank of the river) – Garangala Rock with Lunggu, Glyde River, Raga nuts, Creeks, Beach were Gunmirringu sat, Sea eagle tree, Conch shell. The right hand side of the bark refers to Dhamala (the western side of the bank), from upper right – Milmindjarrk waterhole, Bilma (clapsticks), Dhona (sacred digging stick), mud skipper, catfish.